Arrange polenta slices on a baking sheet coated with cooking spray. Coat tops of polenta with cooking spray. Broil 3 minutes or until thoroughly heated. 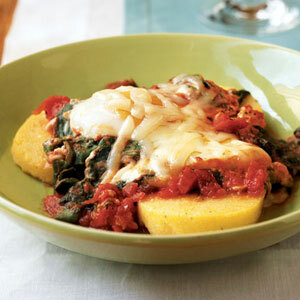 While polenta heats, bring sauce to a simmer in a large nonstick skillet over medium-high heat. Stir in spinach; cover and cook for 1 minute or until spinach wilts. Stir to combine. Make 4 indentations in top of spinach mixture using the back of a wooden spoon. Break 1 egg into each indentation. Cover, reduce heat, and simmer 5 minutes or until eggs are desired degree of doneness. Sprinkle with cheese. Place 3 polenta slices on each of 4 plates; top each serving with one-fourth of spinach mixture and 1 egg.